0.1 Olhausen is an American success story. Olhausen is an American success story. 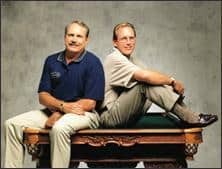 In the picture is Butch and Don Olhausen, founder and owner of Olhausen Billiards Manufacturing company. Butch and Don Olhausen were raised in a pool family - literally. They helped their dad with his clients and their tables until eventually in 1973, a pool table company came up for sale and they took the company over for a smooth purchase price of $1,000. Now, they sell 30,000 tables per year… and there aren’t that many pool tables sold in any given year. Olhausen is a huge company and their tables in pool and billiards and known to be second to none. This page covers their tables in 2015, including what to look for and the best models in any budget range. 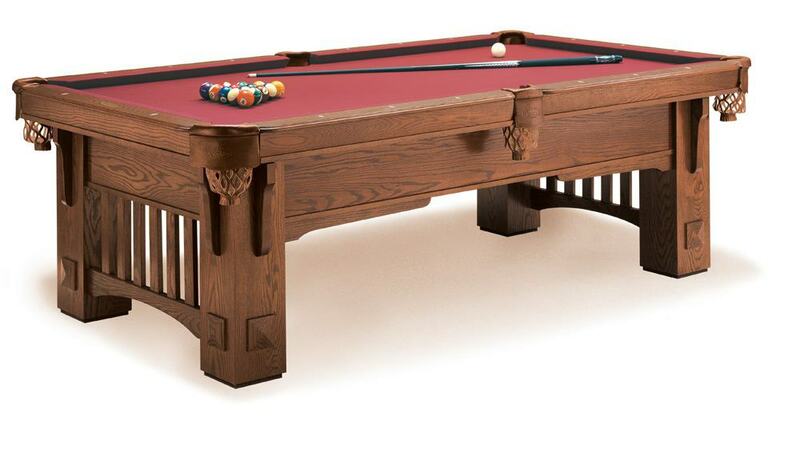 If you’re considering a new table or an Olhausen pool table specifically, read on. Going to a dealer is appealing because of the 1-on-1 shopping experience and how you can try the tables before you buy. The only problem is that in 2015, buying and selling pool tables has moved primarily online - shops like this are few and far between, and you’ll pay hefty markups on the store’s overhead if you can find one near you. Shopping online is now just like being in the store itself. You can customize your table, see live previews, talk to support agents who know what they’re doing, and even get samples of your table shipped to you before ordering it to be assembled. If you happen to be near the 250,000 square foot Olhausen facility in Portland, TN, feel free to stop by and browse. Otherwise, it’s best to do it online and potentially save thousands of dollars as a result of doing so. Set your budget now. 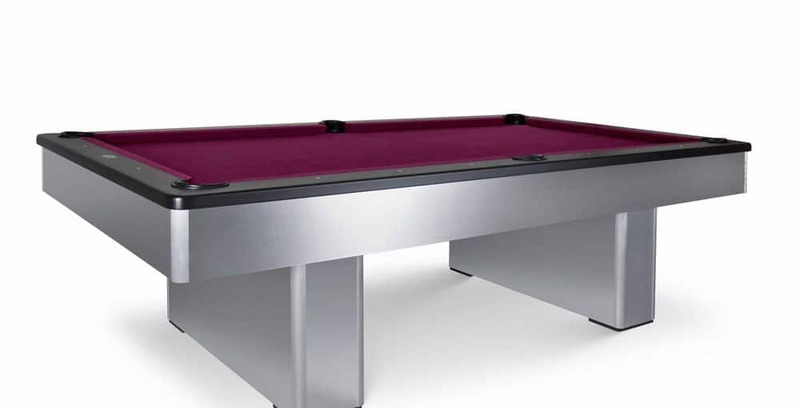 Olhausen has over 30 different models of pool tables available for purchase. No need to get yourself excited over a table only to learn that it’s quadruple what you’re willing to pay. Our favorites from each price range are below. We’ll also give you links to explore everything in that budget range on the official Olhausen site. Prices sourced from TriBilliards.com. Price may vary by merchant. Featuring the Sheraton Laminate stunning in black and magenta felt. The Sheraton Laminate is the least expensive table from Olhausen by a couple hundred dollars. The stock design is a smooth black with a magenta-like purple cloth. You may have seen this model at your local dive bar or music hall. The table is available in 6’, 7’, or 8’ variations. 8’ tables are best when you have the space and adults will be using the table. 7’ is okay for casual play, and 6’ is usually too small for even casual gameplay between skilled players (kids only). Overall, the Sheraton Laminate is a no-nonsense beginner table that’s suitable for the casual game of pool. Click below to learn more. The Drake II just looks like it was made for a game room. Northern Red Oak finish, highlight, and trim gives the wood a smooth look, and the unique pocket design with threaded embellishment brings everything together to make this table very easy on the eye. It’s a good look without being too serious about it all. The Drake II is the perfect addition for anything from a kid’s playroom to a man’s mancave. The fruit of Olhausen and John Deere's licensing agreement. 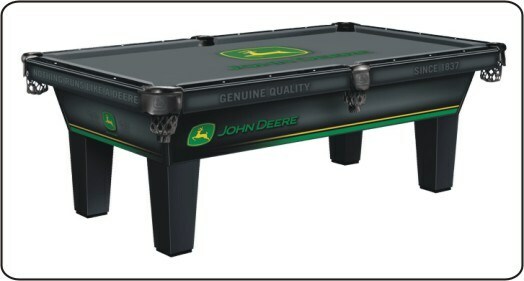 The Olhausen John Deere pool table. Though we’ve heard John Deere makes good tractors, this is actually about their licensing agreement with Olhausen, of all companies. The themed table features a mostly-black finish with plenty of leather and branding throughout. Something about it stands out. We can’t quite put our finger on it, but if you’re someone who likes the look of their more practical machines, you might like their pool table, too. At under $5,000, you’re limited to budget pool tables. 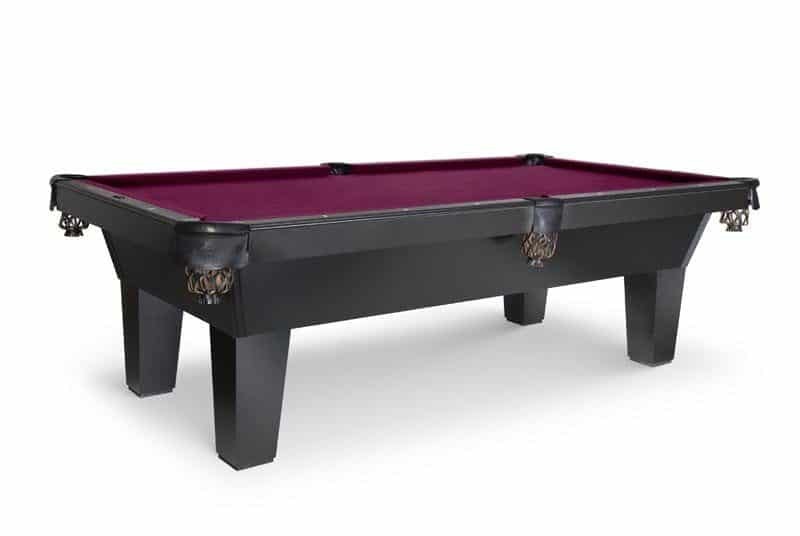 The Eclipse is the closest Olhausen pool table we’ve found that looks like royalty. It has a rustic feel to where it looks like it belongs in a mansion, but comes in at just over $4,000. Looking for something to match a commercial establishment? Maybe a commercial establish with a modern design and the necessity for a consistent ambiance? Or just a modern apartment filled with people who love pool? Look no further than the Monarch. On a computer screen, the base looks shiny and a little tacky. In real life, it’s much more subtle, and it brightens the room without coming off as overbearing. The Layfette is available in walnut, hard maple, cherry. Its most popular make is the oak, though - the design just suits oak perfectly. Leather pockets and a classy, somewhat bulky design means this is a pool table that can be the center of attention in almost any room. 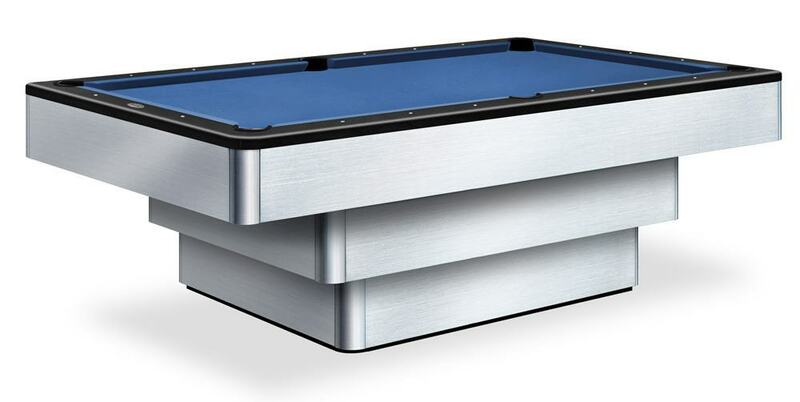 Seeing as we’re getting into the $5,000+ range, make sure you’re getting durable cloth if inexperienced players are going to be taking shots on your brand new Olhausen pool table. Featuring the Coronado with maroon felt. The sexiest and sleekest pool table by Olhausen. The Coronado is a slick pool table. If it were human, it would have flowing, slicked-back hair, a pair of aviators, and a red Corvette… sorta. You’ll have to look at the pictures to see what we mean. The clean metal base and wooden finish give it some class, but also some edge to where it’s not seen as a boring, ordinary, run-of-the-mill game of pool. If that’s your thing, go for the Ponderosa. It’s getting right towards the $10,000 mark, but it’s a pool table you won’t get bored of. The fruit of Olhausen and Maxim's licensing agreement. The Olhausen Maxim pool table. The first of its kind "reversed pyramid" looking table. Just like John Deere, Maxim licensed its name to Olhausen - and Olhausen came up with something crazy. The table is stacked like a reverse pyramid and it catches your eye right away. To our knowledge, there isn’t another pool table like this in existence - if you like to have the thing no one has, consider the Maxim. We’ve covered a lot of modern-looking Olhausen pool tables thus far. Let’s take it back to something you’d expect to find in a king’s palace in the 1500s: the Symphony. Words don’t quite do it justice. The rich staining and intricate design looks like the epitome of luxury. This is one of the pool tables Olhausen is particularly well-known for. To top it all off, customer support from Olhausen is some of the best in the business. Go here to view contact information or call (615) 323-8522 with any questions. Otherwise, head to the Olhausen website and get looking for your new Olhausen pool table. Good luck!